Over 5,000 youth will converge at this year’s Habitat for Humanity “Youth Build”, happening simultaneously on May 3, 2014 in five key provinces in the country, to make a commitment to help rebuild homes across calamity-stricken areas in the Philippines. 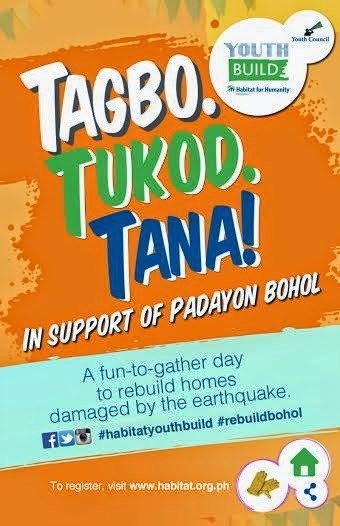 This year’s Youth Build is expected to be one of the biggest youth gatherings in the country. Beginning May 3, young volunteers will sweat it out as they get their gloves, hard hats, and shovels ready to begin the construction of Habitat houses in earthquake-hit areas in Bohol, and Yolanda-affected communities in Cebu, Davao, Cagayan de Oro, and Naga. After Typhoon Yolanda (Haiyan) destroyed parts of the country in November last year, Habitat launched its “#ReBuildPH” campaign with a target to rebuild 30,000 houses. This year’s Youth Build aims to rally the youth to do their share to meet this target. Since the build-sites are mostly around the Visayas region, this year’s theme was taken from the local Visayan dialect - “Tagbo. Tukod. Tana!” (Let’s gather. Let’s build. Let’s do it!.) It hopes to speak more urgently to the Visayan youth to rise to the challenge of helping their own neighbors, friends, and kababayans rebuild their own communities by taking part in the Youth Build. To kick-off festivities in Bohol on May 3, a motorcade of celebrity youth supporters will take place in the morning leading all the way to the Habitat site in Loon, Bohol where Habitat Youth Council will begin the initial build. To cap the day, a youth concert open to the public will be staged to further urge the Boholano youth to respond to the call.